S Size for baby over 3 month old. L Size for baby over 8 month old. – Definitely no odor, it&apos;s FDA EDIBLE silicone. No safety problem. – BPA free, phthalate free, latex free. – Dishwasher safe for sanitizing. – The Brush is durable and safe, while the small bristles massage teeth and gums. 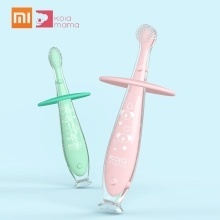 – Designed to be soft and bendable, the Brush reduces the risk of injury to your toddler&apos;s mouth if they fall, unlike traditional hard plastic toothbrushes.